I'm a great fan of pre-registration of studies. It is, to my mind, the most effective safeguard against p-hacking and publication bias, the twin scourges that have led to the literature being awash with false positive findings. When combined with a more formal process, as in Registered Reports, it also allows researchers to benefit from reviewer expertise before they do the study, and to take control of the publication timeline. But one salient objection to pre-registration comes up time and time again: if we pre-register our studies it will destroy the creative side of doing science, and turn it instead into a dull, robotic, cheerless process. We will have to anticipate what we might find, and close our eyes to what the data tell us. Now this is both silly and untrue. For a start, there's nobody stopping anyone from doing fairly unstructured exploration, which may be the only sensible approach when entering a completely new area. The main thing in that case is to just be clear that this is what it is, and not to start applying statistical tests to the findings. If a finding has emerged from observing the data, testing it with p-values is statistically illiterate. Nor is there any prohibition on reporting unexpected findings that emerge in the course of a study. Suppose you do a study with a pre-registered hypothesis and analysis plan, which you adhere to. Meanwhile, a most exciting, unanticipated phenomenon is observed in your experiment. If you are going down the kind of registered reports pathway used in Cortex, you report the planned experiment, and then describe the novel finding in a separate section. Hypothesis-testing and exploration are clearly delineated and no p-values are used for the latter. In fact, with any new exciting observation, any reputable scientist would take steps to check its repeatability, to explore the conditions under which it emerges, and to attempt to develop a theory that can account for it. In effect, all that has happened is that the 'data have spoken' and suggested a new hypothesis, which could potentially be registered and evaluated in the usual way. But would there be instances of important findings that would have been lost to history if we started using pre-registration years ago? Because I wanted examples of serendipitous findings to test this point, I asked Twitter, and lo, Twitter delivered some cracking examples. All of these predate by many years the notion of pre-registration, but note that, in all cases, having made the initial unexpected observation – either from unstructured exploratory research, or in the course of investigating something else - the researchers went on to shore up the findings with further, hypothesis-driven experiments. What they did not do is to report just the initial observation, embellished with statistics, and then move on, as if the presence of a low p-value guaranteed the truth of the result. Here are ten phenomena well-known to psychologists that show how the combination of chance and the prepared mind can lead to important discoveries*. Where I could find one, I cite a primary source, but readers should feel free to contribute further background information. 1. Classical conditioning, Pavlov, 1902. The conventional account of Pavlov's discovery goes like this: He was a physiologist interested in processes of digestion and was studying the tendency of dogs to salivate when presented with food. He noted that over time, the dogs would salivate when the lab assistant entered the room, even before the food was presented, thus discovering the 'conditioned response': a response that is learned by association. A recent account is here. I was not able to find any confirmation of the serendipitous event in either Pavlov's Nobel speech, or in his Royal Society obituary, so it would be interesting to know if this described anywhere in his own writings or those of his contemporaries. One thing that I did (serendipitously) discover from the latter source, was this intriguing detail, which makes it clear that Pavlov would never have had any truck with p-values, even if they had been in use in 1902: "He never employed mathematics even in its elementary form. He frequently said that mathematics is all very well but it confuses clear thinking almost to the same extent as statistics." Chance appears to have played an important role in the discovery of many psychotropic drugs in the early days of psychopharmacology. For instance, tricyclics were initially used to treat tuberculosis, when it was noticed that there was an unanticipated beneficial effect on mood. Even more striking is Hoffman's first-hand account of discovering the psychotropic effects of LSD, which he had developed as a potential circulatory stimulant. After experiencing strange sensations during a laboratory session, Hoffman returned to test the substances he had been working with, including LSD. "Even the first minimum dose of one quarter of a milligram induced a state of intoxication with very severe psychic disturbances, and this persisted for about 12 hours….This first planned experiment with LSD was a particularly terrifying experience because at the time, I had no means of knowing if I should ever return to everyday reality and be restored to a normal state of consciousness. It was only when I became aware of the gradual reinstatement of the old familiar world of reality that I was able to enjoy this greatly enhanced visionary experience". In his Nobel speech, David Hubel recounts how he and Torsten Wiesel were trying to plot receptive fields of visual cortex neurons using dots of light projected onto a screen, with only scant success, when they observed a cell that gave a massive response as a slide was inserted, creating a faint but sharp shadow on the retina. As he memorably put it, "over the audiomonitor, the cell went off like a machine gun". This initial observation led to a rich vein of research, but, again to quote from Hubel "It took us months to convince ourselves that we weren’t at the mercy of some optical artefact". Doreen Kimura reported that when groups of digits were played to the two ears simultaneously, more were reported back from the right than the left ear (review here). This method was subsequently used for assessing cerebral lateralisation in neuropsychological patients, and a theory was developed that linked the right ear advantage to cerebral dominance for language. I have not been able to access a published account of the early work, but I recall being told during a visit to the Montreal Neurological Institute that it had taken time for the right ear advantage to be recognised as a real phenomenon and not a consequence of unbalanced headphones. The method of dichotic listening dated back to Broadbent or earlier, but it had originally been used to assess selective attention rather than cerebral lateralisation. Conrad and Hull (1964) described what they termed 'acoustic confusions' when people were recalling short sequences of visually-presented letters, i.e. errors tended to involve letters that rhymed with the target letter, such as P, D, or G. In preparation for an article celebrating his 100th birthday, I recently listened to a recording of Conrad describing this early work, and explaining that when such errors were observed with auditory presentation, it was assumed they were due to mishearings. Only after further experiments did it become clear that the phenomenon arose in the course of phonological recoding in short-term memory. In his 2014 Nobel lecture, John O'Keefe describes a nice example of unconstrained exploratory research: "… we decided to record from electrodes … as the animal performed simple memory tasks and otherwise went about its daily business. I have to say that at this stage we were very catholic in our approach and expectations and were prepared to see that the cells fire to all types of situations and all types of memories. What we found instead was unexpected and very exciting. Over the course of several months of watching the animals behave while simultaneously listening to and monitoring hippocampal cell activity it became clear that there were two types of cells, the first similar to the one I had originally seen which had as its major correlate some non-specific higher-order aspect of movements, and the second a much more silent type which only sprang into activity at irregular intervals and whose correlate was much more difficult to identify. Looking back at the notes from this period it is clear that there were hints that the animal’s location was important but it was only on a particular day when we were recording from a very clear well isolated cell with a clear correlate that it dawned on me that these cells weren’t particularly interested in what the animal was doing or why it was doing it but rather they were interested in where it was in the environment at the time. The cells were coding for the animal’s location!" Needless to say, once the hypothesis of place cells had been formulated, O'Keefe and colleagues went on to test and develop it in a series of rigorous experiments. In a famous paper, McGurk and McDonald reported a dramatic illusion: when watching a talking head, in which repeated utterances of the syllable [ba] are dubbed on to lip movements for [ga], normal adults report hearing [da]. Those who recommended this example to me mentioned that the mismatching of lips and voices arose through a dubbing error, and there was even the idea that a technician was disciplined for mixing up the tapes, but I've not found a source for that story. I noted with interest that the Nature paper reporting the findings does not contain a single p-value. Peter Thompson kindly sent me an account of his discovery of the Thatcher Illusion (downloadable from here, p. 921). His goal had been to illustrate how spatial frequency information is used in vision, entailing that viewing the same image close up and at a distance will give very different percepts if low spatial frequencies are manipulated. 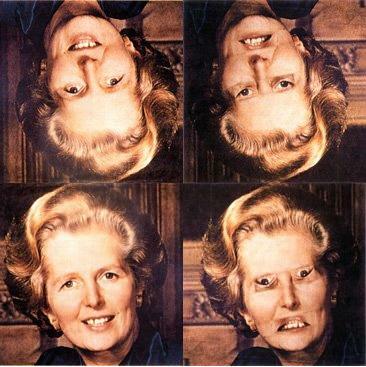 He decided to illustrate this with pictures of Margaret Thatcher, one of which he doctored to invert the eyes and mouth, creating an impressively hideous image. He went to get sellotape to fix the material in place, but noticed that when he returned, approaching the table from the other side, the doctored images were no longer hideous when inverted. Had he had sellotape to hand, we might never have discovered this wonderful illusion. Repetition blindness, described here by Nancy Kanwisher, is the phenomenon whereby people have difficulty detecting repeated words that are presented using rapid serial visual presentation (RSVP) - even when the two occurrences are nonconsecutive and differ in case. I could not find a clear account of the history of the discovery, but it seems that researchers investigating a different problem thought that some stimuli were failing to appear, and then realised these were the repeated ones. Giacomo Rizzolatti and colleagues were recording from cells in the macaque premotor cortex that responded when the animal reached for food, or bit a peanut. To their surprise, they noticed when testing the animals, the same cell that responded when the monkey picked up a peanut also responded when the experimenter did so (see here for summary). Ultimately, they dubbed these cells 'mirror neurons' because they responded both to the animal's own actions and when the animal observed another performing a similar action. The story that mirror neurons were first identified when they started responding during a coffee break as Rizzolatti picked up his espresso appear to be apocryphal. *I picked ones that I deemed the clearest and best-known examples. Many thanks to all the people who suggested others. At a conference years ago, I heard Steve Tipper report in a keynote talk that he was much teased by his fellow PhD students for not only failing to obtain one of the easiest effects, positive priming, but even finding the opposite. Only after much systematic investigation did he realise that he'd stumbled upon the conditions for negative priming. "I noted with interest that the Nature paper reporting the findings does not contain a single p-value." Is it me, or does it seem that this is the case with all examples? It looks like these examples all report discoveries that are more "observational" in nature and not "exploratory results" in the way this is often used in recent discussions. I could be wrong but it seems to me that the recent discussions about confirmatory vs. exploratory findings have the assumptions that statistical tests will be used in both instances, only it will/should be made explicit if the tests were exploratory or confirmatory. I just want to note that if this is (partly) correct, i do not see the above examples of instances in which "exploratory" results (as seen in the context of recent discussions about confirmatory and exploratory research) proved themselves worthy of contributing to scientific knowledge. I understand that they can be seen as "serendipitous" and in that sense they can be seen as counter to things like pre-registration, but i do not think they are examples of "exploratory findings" as they are viewed in recent discussions. Would paying by results improve reproducibility?